Melvin (population 465) is located in eastern Illinois in north central Ford County. Illinois Route 54 runs through the center of town and intersects with County Road E.1200 N Road at Melvin. The Illinois Central Gulf Railroad runs along-side Route 54. The town of Melvin began in 1855 as a peach orchard started by Joshua Nicholson. The orchard produced some good fruit for 12 years before the trees died off in the course of nature. The township was hence named Peach Orchard Township. Melvin was platted in the early 1860's in Peach Orchard Township and was named after a railroad executive who ran his line through Melvin's future site in 1866. Enoch Hunt was the owner of the land that Melvin was set upon. The railroad, which connected St. Louis to Chicago, was completed in 1871 and Melvin was here to stay. The Melvin residents saw the need for a school and began one shortly after being established. 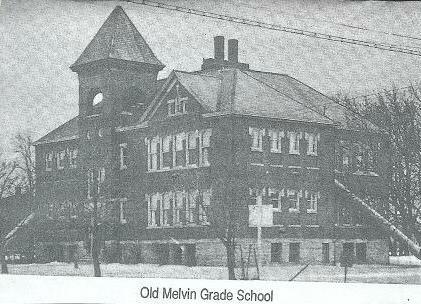 Melvin High School was a three-year high school until 1911, when a fourth year and diplomas were added. Until 1911, Melvin students earned their diplomas at Onarga Grand Prairie Seminary. The original Melvin School building was built in 1904. A newer building was eventually built in 1922. Melvin High School served its residents very well for about 38 years. The state of Illinois urged smaller school districts to consolidate in the late 1940s. Melvin townspeople agreed to consolidate their school system wtih their neighbors from the northwest, Sibley (also on this site). The new school district was aptly named the Melvin-Sibley School District. It is believed that the Melvin High School building was to become the Melvin-Sibley High School building. This district also sadly closed her doors in 1993. The kids of Melvin now attend school in nearby Gibson City as part of the Gibson City Melvin-Sibley School District. The Melvin-Sibley High School building served as the junior high for the Gibson City Melvin-Sibley School District until 2002. A new middle school was built on the north end of Gibson City. The Melvin-Sibley High School building was demolished in 2003 and the land given to the town of Melvin. Melvin put the land to good use transforming a former "temporary classrooms" building into a community center and park on the lot. School team nickname: the "Tigers"
School Fight Song: "Our Dear MCHS"
Your loyal sons and daughters we will be. Way out here in the Prairie State of Illinois. This is the best place in all the state. The Melvin High School boys won IHSA hardware (www.ihsa.org) in basketball and baseball. Football was also offered for a time in the 1920's, as evidenced by a story found in a 1925 edition of the Bloomington Pantagraph. It is probable the school offered track & field as well. We are looking for more information on great teams and individuals in order to complete the Melvin High athletic history. Please e-mail us if you wish to share this information on the site. The Melvin High School boys won two District titles in their brief existence, along with several East Central Illinois Conference and Ford County Tournament titles. The coach of the two District Championship teams was Coach Henry C. Dutler. As with many small schools, "coach" was not the only title earned by Mr. Dutler. He was also the principal, math teacher, P.E. instructor, and coach of ALL sports teams at Melvin High!! Another resource for season records was created by Ryan Tompkins can be viewed at the web address of http://www.gcms.k12.il.us/gcmshs/Boys%20Basketball/melvin-sibley.htm . The Melvin High kids of 1941 were a talented bunch. The team of 1940-41 brought home a District title in baseball to add to their already-earned District title in basketball. Henry C. Dutler - Coach Dutler's record speaks for itself. From 1934-35 through the 1942-43 season, Coach Dutler's "boys" brought a hard-nosed, competitive attitude to whatever sport they competed in. After a stint as a Captain in WW II, Coach Dutler returned to lead the Melvin kids one more time during the 1946-49 basketball seasons. According to Coach's daughter, Jayne Dutler Conner (MHS Class of 1948), Coach Henry Dutler served as Principal, coach, math and PE teacher from fall of 1934 until June of 1949. "My father was not only the Principal and athletic coach at Melvin High, he was also a very innovative man and developed programs outside of athletics that benefited all kids of the school. For example, he started the "Senior Tours," a Melvin High senior class trip held each year. At that time, the Ford County Fair was held on the High School grounds at the beginning of September. The school had a concession stand (pop, candy, popcorn, etc.) set up on the fairgrounds. Each class worked the stand for one day. The money each class made was put into separate accounts. My father planned a tour, lasting around two weeks for the senior class. He calculated the money needed as it coincided with the money that was saved and then divided the amount left by the number of seniors taking the trip. The students had to pay a small amount to make the trip possible. The trip was made by car of which my dad always drove his car. When needed, other cars were provided and driven by a parent, board member, or member of the community. Breakfast was always juice, milk, donuts or rolls from a bakery or a store. Lunch was sandwiches and fruit at a roadside area. "The evening meal was either cooked over a fire or eaten at a restaurant where my dad encouraged the students to try the food that was native to each area. Nights were spent in tourist cabins or tourist homes (motels were not common back then). Ever the teacher, the places visited were state capitals, Gettysburg, Richmond, VA, and Williamsburg, VA. Washington, DC was always on the list. Congressman Leslie Arends, a Melvin High School alum himself, helped out quite a bit by getting passes for the kids to see the White House, Treasury Department, Capitol, etc. The trip would then continue on to New York City, Philadelphia, Boston, and Niagara Falls. I don't think there was a student who went who didn't remember more history on that trip than they did from the classroom. Keep in mind, these trips started during the Depression and the small amount of money given by the parents was a lot to them." Congratulations to Coach and Principal Henry C. Dutler on his incredible successes at Melvin High School!! *Leslie Arends - (MHS Grad of 1912) - From a small school in which he graduated with eight classmates, Mr. Arends continued his education and eventually entered the world of politics, becoming a U.S. Congressman in 1934. He was so well-thought of by his peers that he served as the House Republican Party Whip from 1943-74. Upon his retirement from politics, then-President Gerald Ford made a trip to Melvin in 1974 to honor the retired Congressman.